A very sad Christmas for the Kabuki world: the actors Iwai Hanshirô X (1927~2011) and Kataoka Roen VI (1926~2011) died the 25th of December 2011. Nakamura Matagorô III and his son Nakamura Kashô IV will celebrate their shûmei at the Minamiza in March 2012 [more details] and at the Kanamaruza in April 2012 [more details]! The first Shûzan's Festival outside Tôkyô will commemorate in March 2012 at the Minamiza the memory of Nakamura Kichiemon II's grandfather Nakamura Kichiemon I. No Heisei Nakamuraza in February 2012! The reason is quite simple: this is not related to the fact that February is the coldest month in Tôkyô ... but because of the shûmei of Nakamura Kankurô VI at the Shinbashi Enbujô, where the Nakamuraya guild and their friends will gather [more details]. Ichikawa Ennosuke's young, talented and popular disciple Ichikawa Danjirô took the name of Ichikawa Tsukinosuke II the 19th of December 2011. Ichikawa Tsukinosuke I was a deshi of Ichikawa En'ô I. 21st January 2012 Tenshu Monogatari 15th "Cinema Kabuki"
18th February 2012 Kaijin Bessô 16th "Cinema Kabuki"
17th March 2012 Kôya Hijiri 17th "Cinema Kabuki"
Sakata Tôjûrô celebrated the 25th of November 2011 on the stage of the National Theatre his 100th performance in the role of Tenmaya Ohatsu ("Sonezaki Shinjû") since his shûmei in December 2005. He performed this role for the first time in August 1953 and celebrated his 1000th performance the 16th of january 1995 on the stage of the Nakaza in Ôsaka. He celebrated the 1300th performances the 24th of April 2009 on the stage of the Kabukiza. So far, he performed 1326 times the role of Tenmaya Ohatsu! The Kabuki actors of the Nakamuraya guild, Nakamura Kanzaburô and his two sons, paraded the 27th of November in Asakusa ahead of the succession ceremony of the elder son Nakamura Kantarô, who will take the name of Nakamura Kankurô VI in February 2012 at the Shinbashi Enbujô. The new Kankurô will play the roles of the priest Chichû (in reality the spirit of the ground spider), Lord Matsue and the spirit of the Lion in "Tsuchi Gumo", "Kôchiyama" and "Kagami Jishi" [more details]. The 1st anniversary of the passing away of Living National Treasure Nakamura Tomijûrô will be celebrated in January 2012 at the Shinbashi Enbujô with the staging of the dance-drama "Renjishi" with Nakamura Kichiemon and Nakamura Tomijûrô's son Nakamura Takanosuke in the roles of the parent shishi and the cub. Ichikawa Danshirô is still on sick leave. He won't perform at the National Theatre in December 2011. He will be replaced by Nakamura Tôzô to play the role of Tamura Ukyôdayû in the drama "Genroku Chûshingura". The spectacular drama "Narukami Fudô Kitayama Zakura" was premiered in the 1st lunar month of 1742 in Ôsaka by the Edo star Ichikawa Ebizô II. 270 years later, it will be staged in January 2012 in the same city, at the Shôchikuza, starring the Tôkyô young actor Ichikawa Ebizô XI [more details]. Living National Treasure Nakamura Shikan VII died of lung failure the 10th of October 2011. The Heisei Nakamuraza has just opened a new website, which gives all the details for all the performances in Asakusa from November 2011 to May 2012! Ichikawa Danshirô fell ill the 14th of October 2011 and had to stop performing at the Shinbashi Enbujô. He was replaced by Ichikawa Ukon to play the role of Yokoyama Daizen in the drama "Tôryû Oguri Hangan". He was expected to perform in November 2011 at the Hakataza but he won't be fit. He will be replaced by Nakamura Karoku and Kataoka Ichizô to play the roles of Kudô Saemon Suketsune and Shinoda no Shôji in "Soga no Taimen" and "Kuzu-no-Ha". The Otowaya supporting actor Onoe Kikujûrô IV won official commendation from the director of Japan's Agency for Cultural Affairs. Ichikawa Ennosuke III, who stopped acting in 2004, will take the name of Ichikawa En'ô II. Ichikawa Ennosuke's nephew Ichikawa Kamejirô, one of the most popular actors nowadays, will take the name of Ichikawa Ennosuke IV. Ichikawa Ennosuke's son Kagawa Teruyuki, a movie star in Japan, will make his debut on stage (hatsubutai) and will receive the name of Ichikawa Chûsha IX. Born the 7th of December 1965, he will become a Kabuki actor at the age of 46! It is also worth noting that his yagô will be Omodakaya, not Tachibanaya, which was the yagô of both Ichikawa Chûsha VII and Ichikawa Chûsha VIII. Ichikawa Ennosuke's grandson Kagawa Masaaki will make his debut on stage (hatsubutai) and will receive the name of Ichikawa Danko V.
The Minamiza will commemorate the 800th anniversary of Hônen's death in October 2011 with Living National Treasure Sakata Tôjûrô playing the role of Hônen [more details]. Nakamura Kanzaburô and the Nakamuraya guild will perform "Shunkan" on the Island where Shunkan was exiled ... not in a theater but on the beach, with a real boat bringing the envoy Tanzaemon Motoyasu on Shunkan's island [more details]. Living National Treasure Nakamura Shikan fell ill the 2nd of September 2011 and had to stop performing at the Shinbashi Enbujô. He was replaced by his son Nakamura Fukusuke to play the role of Yodogimi in the drama "Hototogisu Kojô no Rakugetsu". The National Theatre will celebrate its 45th anniversary from October 2011. A new website (in Japanese only), which gives more details about all the events associated to this anniversary, has just opened! October 2011 "Kaimaku Kyôki Adauchi Monogatari", a Kabuki version of Kyokutei Bakin's novel "Kaikan Kyôki Kyôkakuden" ("Daring Adventures of Chivalrous Men", 4 volumes published between 1832 and 1835), which will star the Otowaya guild (Onoe Kikugorô, his son Onoe Kikunosuke and Onoe Shôroku) and Nakamura Tokizô! November 2011 Two Chikamatsu Monzaemon's dramas, the jidaimono "Nihon Furisode Hajime" and the sewamono "Sonezaki Shinjû", with Sakata Tôjûrô, Nakamura Baigyoku, Nakamura Kaishun and Nakamura Kanjaku! The November 2011 kaomise programs at the Shinbashi Enbujô will commemorate the 22th anniversary (23rd memorial service) and the 16th anniversary (17th memorial service) of the deaths of late Onoe Shôroku II and Onoe Baikô VII [more details]. 3 generations of the Matsushimaya guild, Kataoka Nizaemon, his son Kataoka Takatarô and his grandson Kataoka Sennosuke, will perform in the precinct of the Kinpusanji temple in October 2011 [more details]. "Kanadehon Chûshingura" was staged in Iran, in Tehran at Molavi Hall in July 2011. It was a free adaptation staged by Hassan Farzipour as part of the 15th International Ritual-Traditional Theater Festival [more details]. The Kamigata kyôgenkata Horimoto Tarô died the 29th of August 2011. He was born in Ôsaka in 1932 and became a disciple of Matsui Shôzô in 1951. He worked a lot with Kamigata stars like Nakamura Ganjirô II, Hasegawa Kazuo, Kataoka Nizaemon XIII and Jitsukawa Enjaku II. The Heisei Nakamuraza will be back soon in Asakusa, where it will stay up ... to May 2012! The first published program is the November 2011 one [more details]. The Cultural Affair Council has designated veteran Kabuki actor Nakamura Kichiemon as a Living National Treasure. Nakamura Matagorô III and Nakamura Kashô IV will celebrate their shûmei in Nagoya in October 2011 at the Misonoza [more details]. As part as the Shinema Kabuki ("Cinema Kabuki") series, the classic "Kumagai Jin'ya", which was shot live in April 2010 at the Kabukiza, will be released all over Japan from the 8th of October 2011 (this will be the 14th "Cinema Kabuki"). The casting was amazing: Nakamura Kichiemon as Kumagai no Jirô Naozane, Nakamura Baigyoku as Minamoto no Yoshitsune, Nakamura Kaishun as Fuji-no-Kata, Living National Treasure Sakata Tôjûrô as Sagami and late Living National Treasure Nakamura Tomijûrô as Midaroku! There is a short trailer on youtube.com! The Kôraiya supporting actor Matsumoto Kôemon died the 27th of June 2011. Bandô Tamasaburô held a special dance program for the victims of the 2011 Great Eastern Japan Earthquake Disaster in June 2011 at the Yachiyoza [more details]. Onoe Kikunosuke will do the same in July at the Asakusa Kôkaidô [more details]. Mario Vargas Llosa, the 2010 Nobel prize of litterature (and one of my favourite writers! ), held a conference the 23rd of June 2011 at the Tôkyô branch of the Instituto Cervantes. It was entitled "La elegancia del Kabuki" and two Kabuki actors, Nakamura Kyôzô and Nakamura Kazutarô, took part in this event. The young star Ichikawa Ebizô, who had to stop acting on Kabuki stages for some months after a drunken brawl affair in 2010, kept himself busy by becoming the hero of Miike Takashi's movie "Ichimei" (international title: "Hara-kiri: Death of a Samurai"). The story is a tale of revenge, honor and disgrace, centering on a poverty-stricken samurai who discovers the fate of his rônin son-in-law, setting in motion a tense showdown of vengeance against the house of a feudal lord. "Ichimei" was the first 3D movie ever to be shown in official selection at the Cannes Film Festival [official website/IMDB trailer]. "Ichimei" is based on Kobayashi Masaki's 1962 masterpiece "Seppuku" (international title: "Hara-kiri"). The Nagauta shamisen player (and member of the Onoe Kikugorô Gekidan) Kashiwa Isaburô III (1952~2011) died the 1st of June 2011. Ichikawa Sadanji received the Order of the Rising Sun, 5th Class (Gold and Silver Rays), the 27th of June 2011. Onoe Kikunojô II, the 3rd headmaster of the Onoe-ryû school of Buyô, will give his name and the responsability of his school to his son Onoe Seifû, who will take the name of Onoe Kikunojô III in August 2011 while his father will take the name of Onoe Bokusetsu. There will be a special dance program at the National Theatre from the 29th to the 31st of August 2011 in which several Kabuki actors, including the stars of the Onoe clan Onoe Kikugorô and Onoe Kikunosuke, Ichikawa Kamejirô, Ichikawa Somegorô, Onoe Ukon and Fujima Kan'emon, will take part. Nakamura Shijaku II, who was a disciple of late Nakamura Matagorô II, has joined the Matsumoto clan. He will take the name of Matsumoto Kôjaku II in June 2011 at the Shinbashi Enbujô. Matsumoto Kôjaku I (1933~1994) was an onnagata actor, who was a disciple of Matsumoto Kôshirô VIII. The Nagauta singer Sakata Sen'ichirô II (1938~2011) died the 9th of May 2011. The Heisei star Nakamura Kanzaburô will be back on stage in July 2011 (from the 23rd to the 24th of July), in Matsumoto at the Matsumoto Performing Arts Centre [more details]. He stopped acting in February 2011, due to health problems. The young star Ichikawa Ebizô, whose 2010 drunken brawl affair has covered him with ridicule, will be back on stage in July 2011 at the Shinbashi Enbujô [more details]. He will perform alongside his father Ichikawa Danjûrô, who will most likely keep a strict eye on his debauched son. As part as the Shinema Kabuki ("Cinema Kabuki") series, the sewamono "Abura no Jigoku", which was shot live in June 2009 at the Kabukiza, will be released at the Tôgeki the 18th of June 2011 and all over Japan from the 25th of June 2011 (this will be the 13th "Cinema Kabuki"). The roles of Kawachiya Yohê and Okichi were played by Kataoka Nizaemon and his son Kataoka Takatarô. There is a short trailer on youtube.com! Others Kabuki-related consequence of the 2011 Great Eastern Japan Earthquake Disaster: the July 2011 tours in the central and eastern provinces are canceled. Nakamura Hashinosuke is one of the 9 award-winners of the 67th Japan Art Academy Awards (Nihon Geijutsuin Shô) for the year 2010. To all my relatives, friends and acquaintances in Japan: I love and I respect you! You are in my heart and my thoughts everyday! Please stay safe & strong through these difficult times! To help the victims of the earthquake and the tsunami which struck the north-eastern of Japan the 11th of March 2011, the Shôchiku Company have started a huge fund raising campaign in all its movie and Kabuki theaters [more details]. The staging of Tsuruya Nanboku IV's masterpiece "Ehon Gappô-ga-Tsuji" at the National Theatre in March 2011 was stopped from the 15th of March. Bandô Tamasaburô's special Buyô performances in Kosaka (Akita prefecture) at the Kôrakukan, which were expected to happen from the 26th to the 27th of March 2011, were canceled. For the English-reading Kabuki aficionados living in/around Tôkyô (who may need to take all the bad pieces of news out of their mind for a few hours), there will be an opportunity to see Kabuki plays and dances on a movie screen with English subtitles the 7th of May 2011 at the Tôgeki (a famous theatre which used to be the Tôkyô Gekijô!) [more details]. Two new young heirs in the Kabuki world: Nakamura Kantarô's baby son was born the 22nd of February 2011. He is the first grandson of the Heisei star Nakamura Kanzaburô. Ichikawa Ebizô's baby son is due in July 2011; the first good piece of news in 2011 for the Naritaya guild! 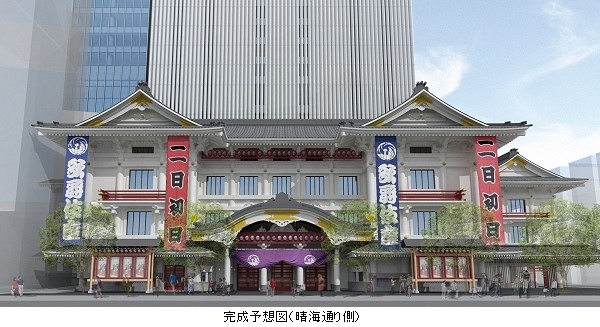 There will be Kabuki performances at the Meijiza in May 2011 [more details]. We have to go back quite in time to find the previous Kabuki performances at the Meijiza: it occurred in June 1995. Ichikawa Sashô III (1926~2011), a disciple of Ichikawa Sadanji III and Ichikawa Sadanji IV, died the 13th of February 2011. His real name was Nakamura Kiyoharu and his yagô was Takashimaya. The dance master Fujima Kankichirô (1931~2011), a disciple of Fujima Kanjûrô VI, died the 10th of February 2011. His real name was Yamaguchi Chûshirô. The Gidayû singer Takemoto Ayatayû III (1933~2011) died the 5th of February 2011. His real name was Hioki Norio. He appeared on stage for the last time in December 2010 at the Minamiza, where he sang in "Terakoya" and "Numazu". The Nagauta shamisen player Kineya Eiichirô II (1946~2011) died the 21st of January 2011. His real name was Yoneda Toyohiko. Nakamura Kanzaburô is on sick leave for a few months (expected to be back on stage in summer?). He won't be able not take part in the March 2011 Kabuki performances in Fukuoka at the Hakataza. Nakamura Kanjaku is the award-winner of the Excellence Prize (yûshô shô) of the 32nd Matsuo Artistic Awards (Matsuo Geinô Shô). He will receive his prize the 29th of March 2011 at the ANA Intercontinental Hotel in Tôkyô. Living National Treasure Nakamura Tomijûrô (1929~2011) died the 3rd of January 2011. The 10th anniversary of the passing away of Nakamura Utaemon VI will be commemorated at the Shinbashi Enbujô in March 2011, with the staging of both "Goten" and "Yoshiwara Suzume" [more details]. Yamazaki Gon'ichi (1929~2011), a disciple of Kawarasaki Gonjûrô II, Kawarasaki Gonjûrô III and Kawarasaki Gonjûrô IV, died the 25th of January 2011. His real name was Onoe Yoshikatsu and his yagô was Yamazakiya. The spectacular and hardly-produced koi tsukami scene (using honmizu) will be staged at the Kanamaruza in April 2011, starring Ichikawa Somegorô in the role of the spirit of the giant carp [more details].